three nyc wine experts share their tips for taking proper care of your wine. of wine? It’s not as simple as uncorking a bottle, and that’s why we enlisted the help of three New York-based Wine Directors and Sommeliers to share their best advice on wine storage to ensure that the bottles we’re drinking at home are stored (and served!) at their best. “Storage depends on philosophy. If you’re drinking younger wines day-to-day, wine thats not meant to archive, it’s important to research which wines are best to drink when they’re young.” We found this especially helpful as our wine collections can be small (or nonexistent), but our wine consumption at home can be frequent, requiring us to know more about younger wines. Beyond storing wine, we wanted to know more about actually serving wine, and if there is any truth to trend and rumor when it comes to our go-to beverage for guests. “Serve at the temperature you store it, and yes…glassware matters. Don’t serve a $90 bottle of wine from a tumbler. Wines need to breathe, you need to work them in the glass a bit, like kneading dough. Aerating your wine can be a personal preference, and you want them to develop aromatically. You should find an all purpose white glass, a basic burgundy, and a basic bordeaux, each with a thin rim”. 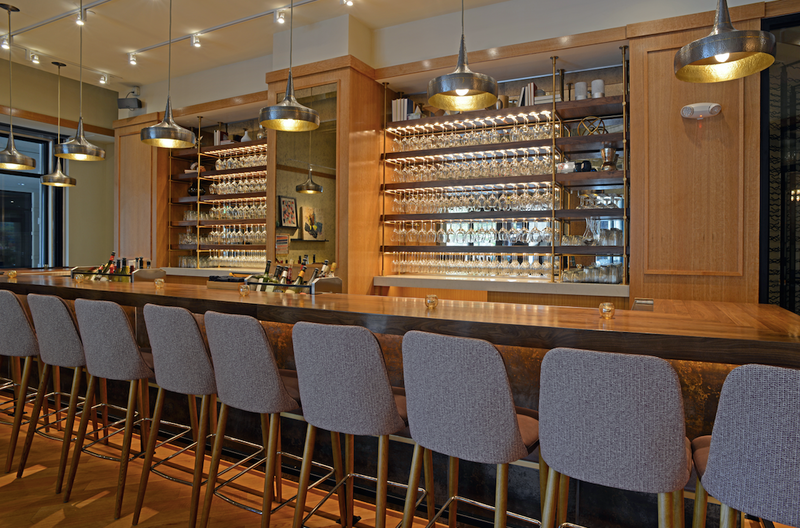 restaurants, who gave us insight into wine storage in situations where space is tight. We had a few “oops…I’ve done that…” moments talking to Patrick, and learned that the “don’ts” of wine storage can be more important than the “do’s”. keep it out on the counter.” Which is when we felt the need to run home and re-arrange our entire wine situation. “Dark doesn’t matter if it doesn’t have cold along with it. Imagine that the wine is alive. If the heat comes up, you’re aging your wine faster, forcing it to move along in its life.” We will never make this mistake again. It’s often easy to feel uninformed about wine, even when ordering in a restaurant. After speaking with Cappiello, we felt as though it’s not that hard to become a “wine person”. In fact, we think you’ll find that many of us already are.
. We felt a bit more confident about small space wine storage practices, but what about homes with ample space? We’ve all got home decor goals, and after chatting with Laura, a dedicated space for wine was certainly one of ours. Now for the fun part. We asked Laura for specifics, wanting to know of a few expert-recommended bottles to always have on hand. We couldn’t resist ending our research by debunking a common wine myth, which thankfully Laura was happy to do. We can’t thank our wine experts enough for changing the way we approach serving and storing our wine. (To think we ever kept it on top of the fridge!). Make the changes necessary to keep your wine at its best, and celebrate your newly acquired knowledge with a glass–at perfect temperature.